There are a lot of sports uniform options on the market, but none beat the single side standard sublimated basketball uniform. Not only is it a great investment for teams, but it also increases players’ performance on the court. Our single side standard sublimated basketball uniform gives you a professional look when playing. Even if you’re an amateur team, you will stand out on the court. They’re also very comfortable and perfectly adapt to your body perfectly. The fabric is lightweight, so it won’t weigh you down; it stays smooth and not stiff, even after countless washes; and it lets your skin breathe, keeping you fresh during even the most high-intensity games and workouts. But the best part of it all is that you have the freedom to customize it! Sublimated basketball uniforms can have virtually any color and design you want. What better way to display your team’s colors than by wearing an entirely customizable uniform? You can create your very own single side standard sublimated basketball uniform with us. You tell us our vision and our expert design team will come up with something original just for you. 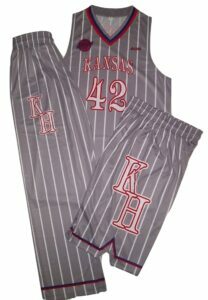 We can provide home and away sublimated basketball uniforms or two different jerseys and one pair of shorts. You have all the freedom to choose! We design sublimated basketball uniforms for all teams, leagues, schools, and organizations. These uniforms are perfect for all teams, no matter their gender or their age. We believe everyone can love playing basketball, so we try to be as inclusive as possible with our uniforms! Get a quote for your very own single side standard sublimated basketball uniform today to stand out on the court tomorrow.